REV23 - Blog - Backup your backup. A guide to healthy database backups. Backup your backup. A guide to healthy database backups. If your main REV23 PC died right now, how well would you recover? What if something even worse happened to that computer where recovery wasn’t an option, such as theft or fire? What would the health of your REV23 database be? These are worst case scenarios, but unfortunately, in eight years of REV23, I’ve seen every horror story imaginable. I’ve seen studios deal with complete data loss and have to start from scratch because they had no backups of their REV23 database, and honestly those stories keep me up some nights. A good backup strategy can be the difference between a breeze and a nightmare when dealing with disaster recovery. First of all, it’s important to note that there is no cloud backup of your REV23 database. Your database never touches REV23 servers in any way. Database backups are your responsibility and yours alone. We provide the tools and guidance to automate this process for you, but you have to take action. On your main REV23 Desktop PC, a Backup Service is installed behind the scenes. The Backup Service automatically takes a backup your database at regular intervals, ideally to an external hard drive. if you’re not currently backing up your database to an external hard drive you need to buy one right this second. Add this external hard drive to your cart and buy it right now. Once received, configure the Backup Service to point to a folder on this hard drive. If you need help, contact support and we'll be more than happy to help you set this up! 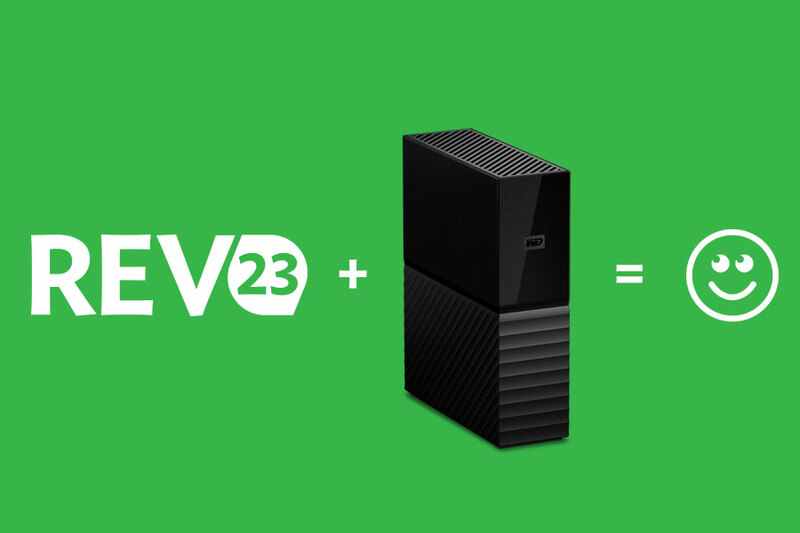 By default, your REV23 Desktop database is backed up daily to your local hard drive in the Backup folder in the REV23 Desktop installation directory. Additionally, backups are automatically taken each time you update your REV23 software, as well as every 7 days when the software closes (if no backup has been taken in that time.) While better than nothing, it does not protect against the most common data loss scenario, hard drive failure or corruption. If the hard drive, which is where data is stored on your PC, dies, your backup unfortunately goes with it. In some cases, this data can be recovered by third party data recovery services, but they are extremely expensive and not always successful. So, having your database backup on a separate drive is obviously best. At a minimum, this should be your backup strategy. But what about a backup of your backup? What about theft, or natural disasters, such as flooding or fire? Hurricanes have forced a whole lot of flooding lately and fires have consumed at least four user studios that I know of since 2010. How would you recover from that? This is why offsite backups are also highly recommended. We recommend at least once weekly, typically the end of the week, perhaps after you run your payout reports, you should take a new backup of your database and save it to another drive. This can be a small USB thumb drive. Once the backup is complete, take this drive with you to your home and store it in a safe location. In this scenario, at most, you’re dealing with a week of data loss. We don’t keep statistics on these scenarios, but from a support perspective, I can tell you I’ve seen more data loss than I would care to. And it breaks my heart every time. In all but a few cases, these stories could have been prevented by even having an external hard drive. However, I’ve also seen the best case scenarios where REV23 users were prepared and as a result, their day (and mine) ended on a much happier note because they took these simple steps. Be like those people and start your new backup strategy today! What is your backup strategy? Has this blog post revealed weak points in yours that you can correct? Let us know in the comments. No truer words have been spoken. When I first started with Rev 23 I was busy setting up the system, adding jewelry inventory and other data to run my shop with and every time I thought about backing up my data I would tell myself Oh I don't have much entered right now so I can wait, it 's no big deal. Six months in my hard drive crashed. I mean totaled. I had to rebuild six months of data off of credit cards receipts and the limited amount of paper work I had accumulated, which wasn't much. Then I had to re-enter all that data on jewelry and aftercare products, services and the list goes on. Didn't seem to me I had put that much time into it until I had to start over again. Now I backup on a thumb drive twice a week and I just purchased an external hard drive which cost me about $90 to take daily backups. My time is valuable and $90. wouldn't begin to cover the time I had to re-invest to get my data back. Go buy you an external hard drive and a thumb drive and spend your time making money. Thanks Melissa for formatting my thumb drive. Thanks for sharing your story, Neil! It's an unfortunate and sometimes expensive lesson to learn. Not just with REV23, but any data stored on your computers or phones. You must be signed in to comment. Sign in or register to join the conversation!